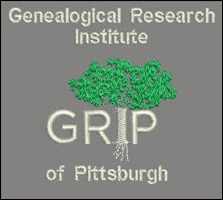 If you’re still wondering what to do to enhance your genealogical education this summer, here’s one last reminder — registration begins tomorrow, Wednesday, February 22, for the June session at the Genealogical Research Institute of Pittsburgh. GRIP is heading into its sixth season at LaRoche College in Pittsburgh, and there are two sessions, one in June and one in July, offering in-depth immersion for an entire week. Tomorrow’s registration is for the June classes, running June 25-30, and one of them might be just what you’re looking for. If not, there will be six more a bit later — a second session runs from July 16-21 — and registration for those courses will be held March 8th. Because this line-up is so solid, class space is going to go fast. If you want in, you need to be ready to go when registration opens tomorrow, February 22, at noon Eastern, 11 a.m. Central, 10 a.m. Mountain and 9 a.m. Pacific. Tomorrow’s registration is only for the six courses to be offered at LaRoche College in June. And there will be more to come in July, with registration on March 8th!